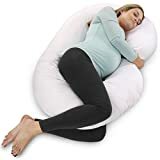 This article will share the best pregnancy pillows which are exclusively designed to position your body for an optimal night’s sleep. Aside from being extremely comfortable, the pillows offer many benefits for mom and her developing baby. It is no wonder pregnancy pillows are becoming very popular. 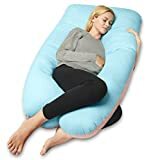 Based on what I have observed in clinical practice over the years, I believe pregnancy pillows should be routinely recommended. The pillow can be a preventive medical intervention to improve placental-fetal circulation and maternal well-being. 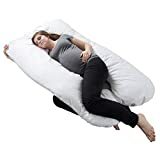 It is my hope that every pregnant woman is made aware of how beneficial full length pregnancy pillows can be when it comes to maternal comfort. Nothing worse than having a new mom learn about the benefits of these pillows after delivery. 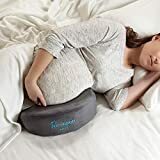 Below are 5 benefits of the best pregnancy pillows sited by prenatal care providers and women who have used one during their pregnancy. If you are planning pregnancy or are currently pregnant, this is an item you will have wished you had known about from the very start. Many women, even after delivery, refuse to give up their pillow and… yes…men like them too! Improves back pain. It is estimated that up to 80% of women experience back pain in the lumbar region (not related to an underlying medical problem). For this situation, the best pregnancy pillows can offer significant relief, particularly when carrying twins or triplets. Improves blood circulation, to your developing baby by maintaining a left-sided sleeping position throughout the night. See our article on left-sided sleeping position during pregnancy. The post clearly demonstrates why there is an improvement of blood flow to the placenta and fetus when lying on one’s left side. Prolongs sleeping time, leaving you feeling well-rested the next day. Maternal comfort as a result of proper anatomic alignment, there is less strain on ligaments and less impingement on nerves that are Impinged on during pregnancy. The comfort can be dramatic such that you will not want to continue using the pillow long after your deliver. Don’t be surprised if you find your partner on the computer in the middle of the night ordering one for his/her self. They can be addictive. Prevents tossing and turning, especially during your third trimester and for those carrying twins or triplets. Is the cover removable? No doubt you will want to wash the cover periodically. What is the pillow filled with? There are many fillers and we all have our favorite: Micro beads, Memory Foam, Polyester, Styrofoam, Organic (bamboo), Buckwheat, etc..
Is the pillow considered a therapeutic pillow? Therapeutic pillows are better support for the neck and consist of two compartments, a water pouch surrounded by memory foam. Is it durable? You will likely be using it long after your baby is born? If you have allergies, is it hypoallergenic? Based on the filler, some pillows can be noisy (styrofoam, buckwheat) or have a chemical smell (some memory pillows can have a chemical odor). How it suits your sleep position, understanding that the proper sleep position during pregnancy is on your left side. Do you prefer pillows that are firm or hard? This is simply a personal preference. What pillow size do you need? Pillows for twins are available (so be thinking ahead). * Always discuss any pregnancy concerns (insomnia, back pain, swelling etc.) with your prenatal care provider. 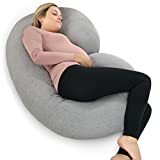 Though the pillows listed are believed to be among the best pregnancy pillows there are many pillows to choose from and they can all be very therapeutic, particularly during the third trimester.